The eldest child of Edward IV and Elizabeth Woodville, Elizabeth of York was born at Westminster on 11th February, 1466. She was christened by George Neville, Archbishop of York and her godparents were Richard Neville, Earl of Warwick, Cecily Neville, Dowager Duchess of York and Jacquetta, Duchess of Bedford. Elizabeth's parents had married secretly at Grafton Manor, soon after her father's accession to the throne. 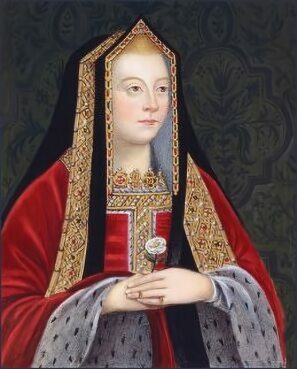 Her mother, Elizabeth Woodville, was the daughter of Sir Richard Woodville, (later created Earl Rivers) and Jacquetta of Luxemburg, the widow of John, Duke of Bedford (the brother of Henry V) Edward IV had met Elizabeth's mother, the widow of Sir John Grey, a Lancastrian knight who was killed at St. Albans in 1461, when she came to petition him for the return of her husband's estates. Edward had wanted to make her his mistress, but she held out for marriage. Elizabeth Woodville had two sons by her first marriage, Thomas Grey (1455-1501), later created Marquis Dorset and Lord Ferrers of Groby and Sir Richard Grey, who was later executed by Richard III in 1483. A marriage was arranged for her in her childhood to George Neville, but, when the Neville family deserted her father's cause, she was promised to the Dauphin of France in 1475 at the age of 9, which also came to nothing. Following the death of her father and the usurpation of Richard III, Elizabeth and her siblings, including Edward V and Richard, Duke of York, the so called Princes in the Tower, were declared illegitimate by the Act of Titulus Regius. Her young brothers disappeared inside the Tower of London amidst rumours that they had been murdered, how Elizabeth herself reacted to their demise has gone unrecorded, she had at the time taken sanctuary with her mother at Westminster Abbey. Rumour suggested that Richard III was planning to marry her himself. Her mother, in secret correspondence with Margaret Beaufort, agreed to the marriage of Elizabeth and Margaret's son, Richard III's rival and the exiled heir to the House of Lancaster, Henry Tudor, Earl of Richmond, who took a public oath to marry Elizabeth should he became King of England. Richmond became King Henry VII after his victory over Richard III at Bosworth Field and the Princess was brought back to London from Sheriff Hutton Castle in Yorkshire. Henry was crowned at Westminster alone on 30th October, to underline that he ruled in his own right. Parliament petitioned the king to honour his promise to marry the Yorkist heiress and the marriage of Elizabeth of York and Henry VII was finally celebrated on 18th January 1486 at Westminster Abbey. 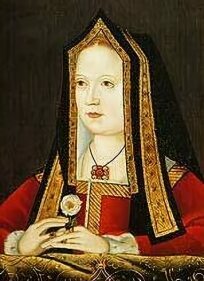 As the eldest daughter of King Edward IV with no surviving brothers, Elizabeth of York had a strong claim to the throne in her own right, but she did not rule as queen regnant, the rule of a queen regnant would not be accepted in England for another sixty-seven years until the ascension of Elizabeth's granddaughter, Mary I. Nine months later, the new Queen was delivered of a son. He was given the symbolic name of Arthur, in honour of the legendary Dark Age British King. Elizabeth was finally crowned Queen Consort on 25 November, 1487. Elizabeth was tall, fair haired, attractive and gentle natured. Despite being a political arrangement, the marriage proved successful and both partners appear to have genuinely cared for each other. Elizabeth was generous to her relations, servants and benefactors, she enjoyed music and dancing, as well as dicing. The Queen's household was ruled by Lady Margaret Beaufort. The Queen's own mother, the meddlesome and grasping Elizabeth Woodville, suspected of involvement in Yorkist plots, was shut up in a nunnery and stripped of all her belongings. The marriage of Elizabeth of York and Henry VII was to produce seven children, of which only four survived the perils of infancy in Tudor times. One of these was the future Henry VIII. 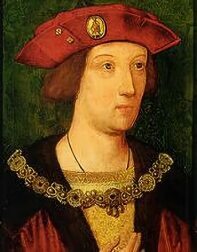 Both Elizabeth and Henry deeply grieved the loss of their eldest son and heir, Arthur, Prince of Wales, who died at Ludlow Castle on the Welsh borders on 2nd April, 1502, shortly after his marriage to Catherine of Aragon. The prince is said to have died of either the sweating sickness, consumption or tuberculosis. The couple attempted to console each other. 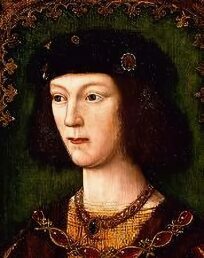 Only one male heir to the Tudor throne now survived, the young Prince Henry, Duke of York. The couple decided to try for another son and Elizabeth quickly became pregnant. The child, a girl named Katherine, was born on 2 February, 1503, at the Tower of London and died on the same day. Tragically, Elizabeth of York followed her to the grave nine days later, dying of a post-pregnancy infection on her 37th birthday. Her body was removed from the chamber where she died to the chapel within the Tower, under the steps of which the the bodies of her brothers, Edward V and Richard Duke of York were to be discovered nearly two centuries later. Her body then lay in state at the Tower. Elizabeth was buried at Westminster Abbey. Her magnificent effigy by the Renaissance sculptor Pietro Torrigiano, which lies beside that of her husband, can still be seen in the Henry VII Chapel at Westminster Abbey. Arthur predeceased his father, Henry VII, he died suddenly at the early age of 15, of the sweating sickness, at Ludlow Castle in the Welsh Marches soon after his marriage to Katherine of Aragon, and is buried at Worcester Cathedral. There was no issue from the marriage. *Margaret Tudor, (November 28, 1489 - October 18, 1541) m. (1) James IV, King of Scots (2) Archibald Douglas, Earl of Angus (3) Henry Stewart, Lord Methven. *Elizabeth Tudor (July 2, 1492 - September 14, 1495). Elizabeth Tudor died of atrophy, around six months before the birth of her sister Mary. She was buried in Westminster Abbey. Henry Brandon, Earl of Lincoln (1516 -1534) - created Earl of Lincoln by Henry VIII on 18 June 1525 at the age of only two, Henry died at the age of ten or eleven. Lady Frances Brandon (1517 -1559) married (1) Henry Grey, Duke of Suffolk (2) Adrian Stokes -the mother of Lady Jane Grey the nine days Queen, who was executed in the reign of Mary I. *Edmund Tudor, Duke of Somerset (February 21, 1499 - June 19, 1500). Edmund Tudor died at 15 months of unknown causes, and was buried at Westminster Abbey. 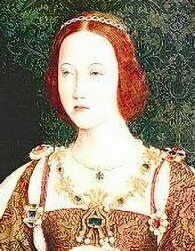 *Katherine Tudor (born & died February, 1503). 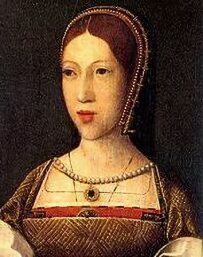 Katherine Tudor died a few days after her birth.